You see mobile keyword technology all over TV and hear it on the radio everyday. You see it advertised in magazines, newspapers, blogs, websites, and all over billboards. There's a reason why large corporations utilize mobile marketing – it WORKS! 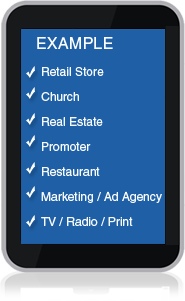 People text your custom mobile keyword to 69302 to join your mobile distribution list. Then an automated response is texted back to them with your customized welcome offer. Later, you can send them important text alerts, news, and promotions, resulting in huge and immediate response rates that you can't experience with email marketing alone. Launch successful promotions, newsletters, video training, and more with our proven Internet Marketing System.